Do you have a friendship bracelet knotting, mistake-fixing or pattern question? My chevron bracelet always has loads of holes and you can see anchor strings in it. How do I avoid this? What Am I Doing Wrong Wtih My Candy Stripe Bracelet? I'm trying the candy stripe bracelet for the first time and i don't think it is turning out right. Could you please tell me what I'm doing wrong? What Are There Pattern Names For These Bracelets? When making the candy strip bracelet I cannot seem to get it the go in the straight line. How can I fix that? Is It Normal For The Candy Stripe To Twist? I am making a Candy-stripe friendship bracelet, and as I keep knotting, the bracelet is twisting. Is this normal? How Do You Make a Super Wide Friendship Bracelet? What Technique Is Used In This Leather Bracelet? Hello, I saw this bracelet and was wondering if it was possible to make one myself. What is the technique called and how do I do it? How To Put Letters In Friendship Bracelets. What is a forward-forward knot? What is a forward knot? How Do I Make Two Solid Lines Of Color? Where Can I Find Friendship Bracelet Pattern Books? When I make a candy stripe friendship bracelet it always twists, why does it twist? Do you have the instructions for some very unique patterns? Christine, please tell me how to put letters into my bracelets. That is how I would like to make them unique! I am confused. I can't seem to get it right and I just wasted A LOT of expensive floss!! How do I make a Chinese Stair Case out of embroidery floss? How many colors can you do besides five? Okay, all I want to know is where are the pictures? If I were making this bracelet I would want to know what the knot looks like!!! I was making the zig zag bracelet and I was wondering if it's supposed to twist? Can I use yarn, thread, or ribbon for any of these bracelets? Correct measuring for friendship bracelets? Friendship bracelet with button fastener? How do you put on a button to fasten a bracelet with instead of a knot? How do you braid the ends of the candy stripe bracelet like after you're done with the knotting? I wanted to know how to make a bracelet with a message made into it. I've seen it before and I would love to make one for someone. How Do I Make This Bracelet? Okay so I found a picture of this bracelet (the picture uploaded) and I REALLY want to know how to make it!! Please help me?! Can I have a detailed description for how to make friendship bracelets? 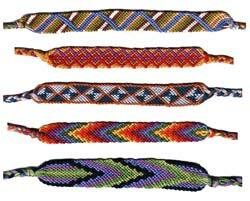 How can I keep my friendship bracelets from twisting? What Type of String To Use? Are there other ways to "finish" friendship bracelets other than the braided ends? What are some good color combinations to use in a Chevron bracelet? How do I get my bracelet to not curl at the end of a row? Hello, How do yo make the candy striped friendship bracelet with four colors? Bordered Chevron Friendship Bracelet - Step 8? In the bordered chevron, step 8 says to continue steps 4-7, does it mean 4 to 7 or 4 and seven? Hi, When I am making mine I forget which one of the same color comes next. Dose it matter or can I keep going? Please reply. How do I make bracelets like the third one in the picture? What are the different types of friendship bracelets? The alternating Chevron bracelet that I'm making is not alternating. What am I doing wrong? Can you please post the Ladder design? Why does my friendship bracelet twist when I knot it? Do you guys have books for making friendship bracelets? How many strings do you need for a double chevron? I really want to know the useful way to finish the friendship knot necklace. Please help me,thanks. What is a reverse knot? Can you make a candy stripe bracelet without 3 ft. of embroidery floss (I call it string)?? How do I make an easy friendship bracelet? How do you start a friendship bracelet? How do I make a friendship band with a name on it and where do you buy the string that is used for making the friendship band? I can't find them. Do you know where I can get the materials and how? How do I make a bracelet with squares with a black line separating each square? How do you make the checkered diamond bracelet? Is there anyway to make the Chevron wider without adding more colors??? I try to make a Chevron bracelet, but when I do, the two ends separate! Help?! I don't know how to finish the wave and loop bracelet. I don't understand the step 7 and 8 in the Advanced Zig Zag Friendship bracelet. Would you please help me? How should I make backward knots?? How do you knot a bracelet with only word instuctions? Can we have some more patterns please? In the background of the Candy Stripe Pattern video, there is a bracelet with a diamond pattern! How do I make that one? When making the Double Chevron, after you are done with all of the knots for the first color, do you switch the color you use to repeat? Can you post a tutorial on how to make a friendship bracelet with letters? How much string do I need for each of the strings on my bracelet? How to make a star? I want to make an embroidered bracelet with names in it. About 6 inches long. How long should the strings be? What's the backwards knot and forwards knot? Sometimes when I do stripes and the zigzag, the bracelet curls up. Am I making it too tight? How do I fix this? How to you make a friendship bracelet that has music notes in it?